Sustenance & Desire: A Food Lover’s Anthology of Sensuality and Humor, is a compilation of works that encompasses all things we love at Manhattan Fruitier; still life paintings & poetry and prose by well-known writers all explicitly detailing man’s sensual & humorous relationship with food. 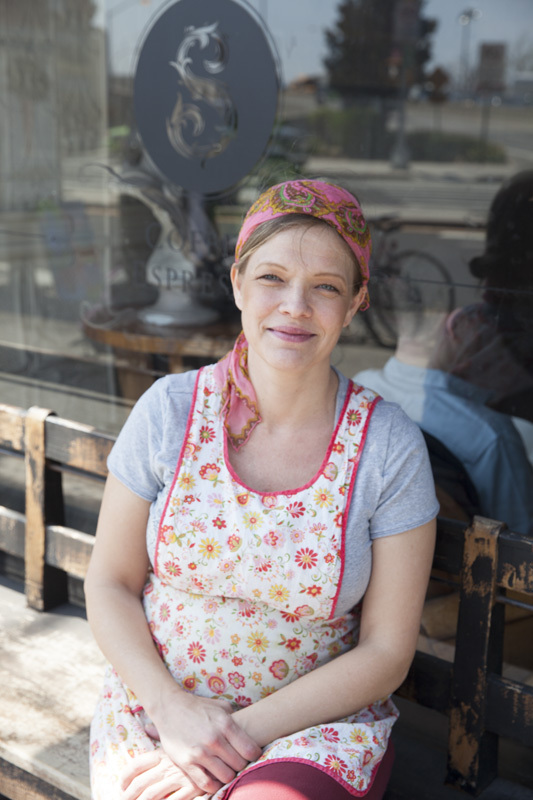 Artist, anthologist, and long-time friend of Manhattan Fruitier, Bascove, recently let us in on the inside scoop on Sustenance & Desire: A Food Lover’s Anthology of Sensuality and Humor. What was your inspiration behind Sustenance & Desire: A Food Lover’s Anthology Of Sensuality & Humor? 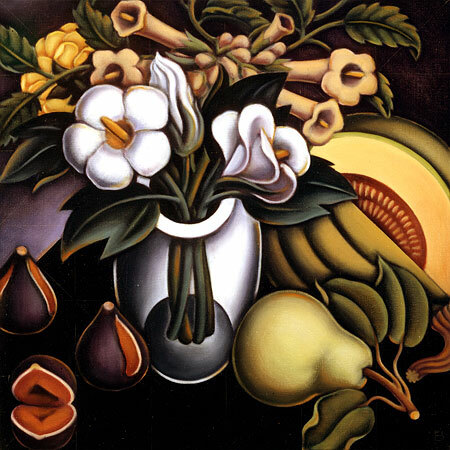 Still lifes have always been a genre I adore. Over the years I have painted dozens. It’s a joy to study and interpret a thoroughly delicious subject. I had already produced books on two of my passions; bridges and reading. Food seemed like a natural addition. With all the available food literature by great writers, how did you go about selecting which authors & works to include? I was familiar with the work of most of these writers. How could an anthology not include Proust’s glorious reveries from the taste of madeleines or Nabokov’s from hunting for mushrooms? Thinking about food, thinking deeply, brought about many issues; it’s necessity, of course, but could any other subject be so steeped in social, political, and spiritual components? I read through stacks of books of poetry and prose, it was like a treasure hunt. It began to take shape as a collection about food as love, as laughter, as need, as memory, and as the multitude connections between families, lovers, and friends. Which specific piece in the anthology resonates with you the most? Have you had any experiences where fresh fruit played a prominent role? Yes. In Paris, in the fall, the markets have copious amounts of the most sublime fruit, most noticeably fresh figs. I had never experienced any taste quite as grand, I would go through bowlfuls of them. My work was shown at a gallery in Paris for over 20 years. I would schedule my exhibitions for the fall so I could satisfy my addiction. My dear friend, and owner of the gallery, would often have a “demi-kilo” waiting at the little hotel where my husband and I would stay. If you were an insect, what fruit would you want to pollinate? Figs are infinitely appealing, but being claustrophobic I would never have the endurance of those implacable female fig wasps. Cherry pollination seems like a safer trade. How many servings of fruit do you eat on an average day? Three to four, but in summer that number can easily increase. 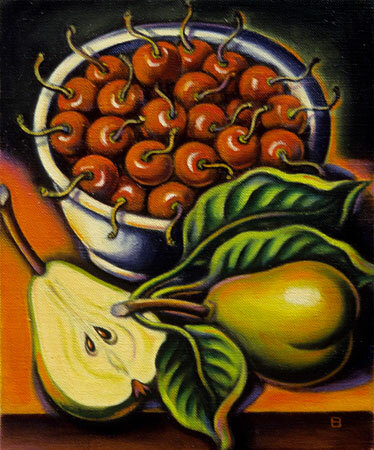 If you were limited to only one fruit forever, what would it be? With Solo exhibitions at the Museum of the City of New York, the Arsenal in Central Park, the Municipal Art Society, the Hudson River Museum, the Noble Maritime Collection, NYU Fales Library, and The National Arts Club, Bascove has documented and celebrated the Bridges of New York City. She has worked with The New York, Brooklyn, and Roosevelt Island Historical Societies, and has lectured and arranged events with the Museum of the City of New York, the Central Park Conservancy, the New York City Department of Parks and Recreation, the Municipal Art Society, NYU Fales Library, and the Hudson River Museum. 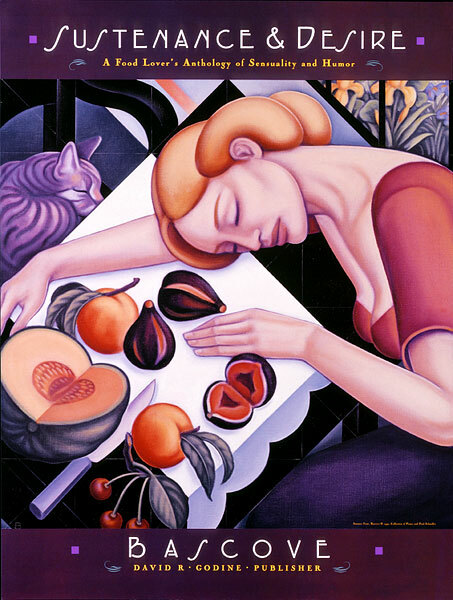 Three collections of her paintings have been published, accompanied by anthologies of related writings: Sustenance & Desire: A Food Lover‘s Anthology of Sensuality and Humor, Where Books Fall Open: A Reader’s Anthology of Wit and Passion, and Stone and Steel: Paintings and Writings Celebrating the Bridges of New York City. 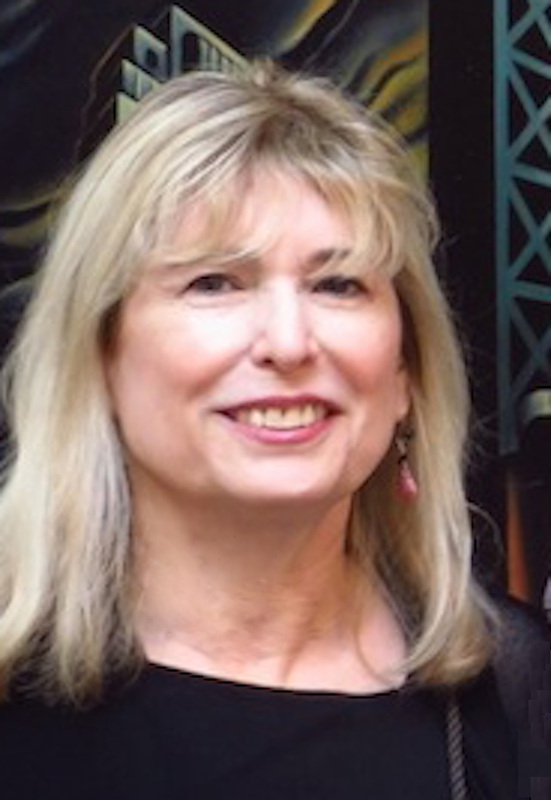 As a writer she has been a contributor to Arte Fuse, Stay Thirsty, The Three Tomatoes, and New York Arts Magazine. Her work is in the collections of the Museum of the City of New York, Pennsylvania Academy of the Fine Arts, The Linda Lee Alter Collection of Art by Women, Mount Sinai School of Medicine, the Noble Maritime Collection, the Harry Ransom Collection, University of Texas at Austin, The New York Public Library, MTA Arts for Transit, The Library and National Archives, Canada, the Rachofsky Collection, the Norwalk Transit District, Time Warner, the Oresman Collection, The Wittliff Collections, Texas State University, and Musée de Cherbourg. Candles in the home set a mood, impart a scent, illuminate a dinner table. What if these candles were given more than a flicker of imagination, a spark of something truly transformative? Artist Andrej Urem, Manhattan Fruitier’s October Maker of the Month, transforms utilitarian candles into gorgeous, livable works of art by sculpting and hand-pouring soy and beeswax into platonic forms. These candles are part of our SPARK collection because they are beautifully designed and expertly crafted. Learn more about artist Andrej Urem’s inspirations and process in his studio interview. 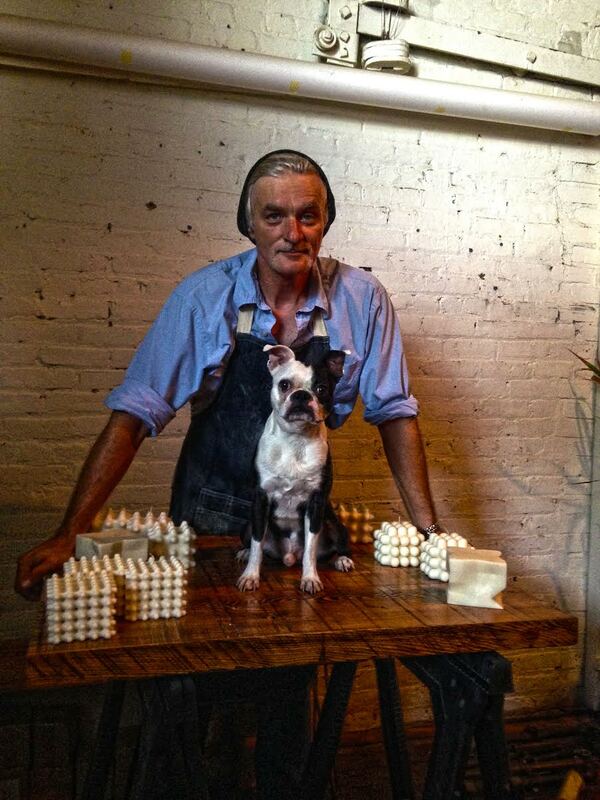 Artist Andrej Urem in his Gowanus studio with Boston Terrier, Tank. 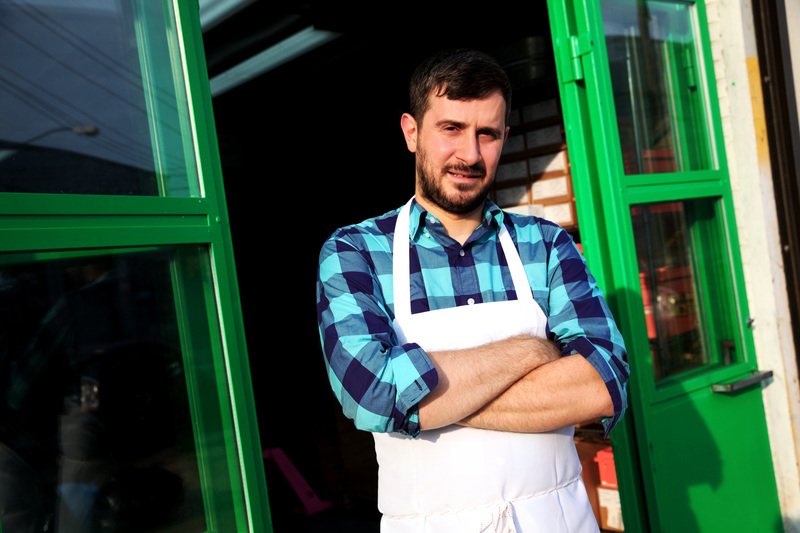 Tin Dizdarevic, creator of Tin Mustard outside his Red Hook production facility. Chris Woehrle of Kings County Beef Jerky in Brooklyn, NY. Your run of the mill beef jerky from a highway rest stop or convenience store certainly would never win any food awards and you’ve probably been steering clear of it for years. But that’s the old story. There’s a new brand of beef jerky on the block that has attracted the attention of food critics, beef lovers, health conscious snackers and many of us who have returned to the beef jerky fold. Our June Makers of the Month, Robert Stout & Chris Woehrle of Kings County Jerky Co., are pioneers of the 21st century craft jerky movement, one that focuses on top notch ingredients and craftsmanship that your great, great grandparents would recognize. 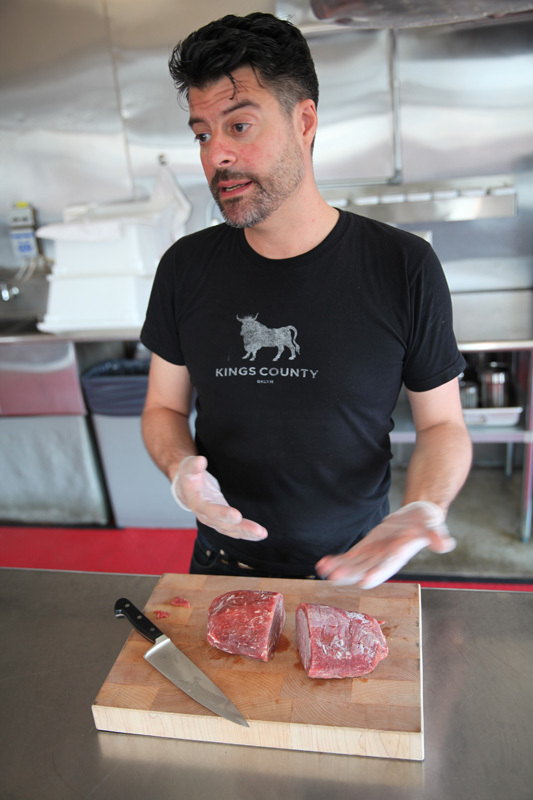 Kings County and Co. takes the ‘mystery’ out of the meat, using only grass-fed, top round beef, never nitrates, corn syrup or preservatives. Their jerky is an all-natural, healthy, high protein treat worthy of kings and paupers alike.